F amily celebration was on Friday 12/26. All gifts were well received. I wasn't sure about the hats. Most of them were worn for the rest of the day. The older kids also wore their hats all day. What do you get teen age boys? Fleece hats worked this year. Most of the men got handknit socks. I have one picture, of MB opening his hat, with Dad's socks on his arms. It reminds me of the year that we gave mittens, which were worn when opening the rest of the gifts. Grandpa said they couldn't be taken off. One guy got fingerless mitts because he lost one from last year . He can take photos with them on. The pattern is free on Ravelry. Christmas day was quiet, just the two of us. Lots of knitting happened. I did make one mistake on a gift for DH. I bought him some long underwear in size small!!. H e's 6'2". He hasn't worn small since I've known him. They've been exchanged. While I was at the store, I wandered into the kitchen department. I made spritz cookies for the family cookie exchange and my cookie spritzer broke. While I was there, I found the neatest things for a little girl who'll turn 4 years old in a couple of weeks, her own kitchen tools. 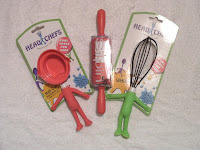 There is a measuring cup (1/4 and 1/2 cup), a rolling pin, and a whisk. I didn't see anything else. but these seem well made and fun. 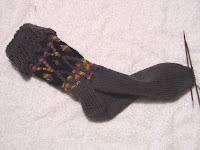 I've finished one sock for a January birthday. It's the same pattern as the last pair where I ran out of yarn, but the look is quite different. I put the color values in different places. The foot is twisted becaus I haven't closed the toe.